Some of the really outstanding Brugmansia varieties are the white flowering angels trumpets. This is a large woody shrub that will reach around 4 m in height depending on conditions. In good conditions, moist soil and warmth plants can reach twice the height. If you are looking for dramatic white flowers then White Angels Trumpets are high on the list. Large, to around 40 cm long and 20 cm across sold in Australia are double flowering. The large white trumpet shaped flowers appear from spring through to autumn. Large and fragrant the flowers appear in numbers and hang gracefully beneath the foliage. We suggest planting the white flowering angle’s trumpet at the rear of the garden border against a deep green backdrop. The white flowers will be highlighted and create a dramatic image. In terms of images, Max Dupain an Australian photographer used these flowers as subjects many times. A sheltered position with a moist soil and good filtered light. Fertilize with well rotted animal manure in spring and again in autumn, a general purpose slow release fertilizer in late spring will help. Plants can be pruned in summer, or in fact just about any time of the year except mid winter. 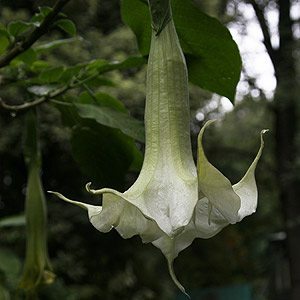 Use caution and wear gloves as all parts of the White Angel’s Trumpet are poisonous.